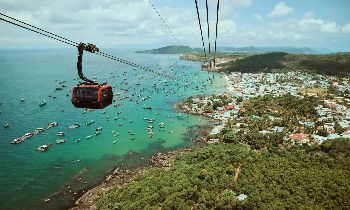 Being the capital one as well as the largest one of Phu Quoc island district, Duong Dong town is a must-visit spot when taking Phu Quoc tours. 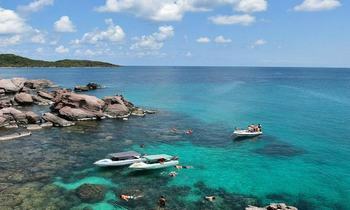 There are several amazing tourist destinations in Phu Quoc, which offer visitors exciting experiences. In which, Duong Dong beach and Cau temple can’t be ignored. In fact, the real name of this beach follows the town, and “Long Beach” is mostly used in the tourism industry. 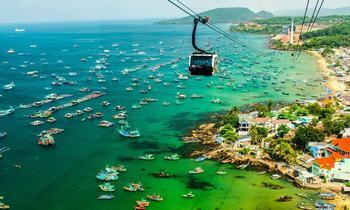 Duong Dong Beach may be one of the most tropical-looking beaches in Vietnam. 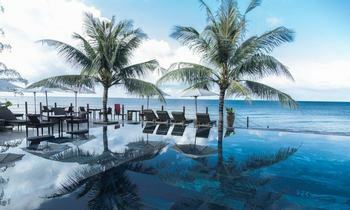 As Phu Quoc owns a unique position in the Gulf of Thailand, it is framed by the relatively calm seas and benefits protection from the typhoons as well as big waves pounding Vietnam's east coast. 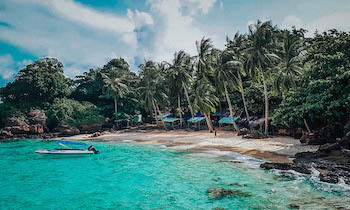 Consequently, beaches in Phu Quoc's west coast looks more like that of nearby Thailand rather than beaches on the rest of the open and exposed coast of Vietnam. The zone of Duong Dong Beach is actually a separate strip of sand, cutting off from the beach's main part by a small rock protrusion. It's easy to walk over this rock. Because lying on the island's west coast, Duong Dong beach offers the excellent views of sunset and is famous for being one of Vietnamese few beaches where you can watch the sun falling into the ocean. 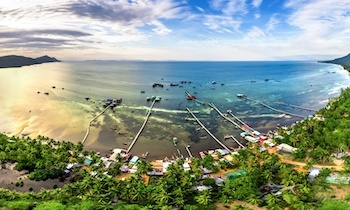 Phu Quoc has beaches stretching along most of its west coast. These long beaches are often empty and narrow and with the shallow water. 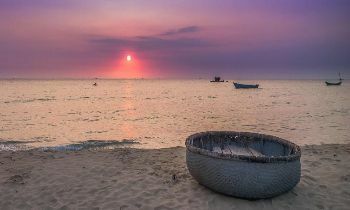 No other parts of Phu Quoc island can compete Duong Dong for the classic beauty of a beach. Duong Dong Beach begins at the mouth of a small river offering the fishing fleet shelter and running through the center of the town. 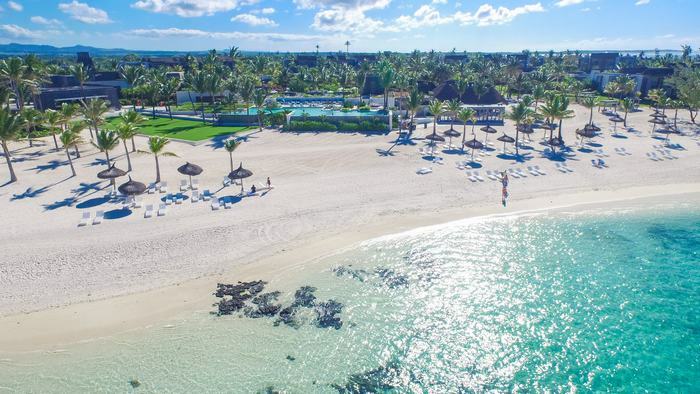 This beach is quite close to the capital town, which results in the obvious benefits of convenience – tourist can walk from their beachfront accommodation to the night market for shopping or dining. 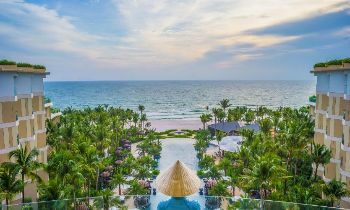 The resort furthest from Duong Dong town is just 1,500 meters away, while the south end of Duong Dong beach is 2.7 kilometers from town, which can take a 30-minute walk. However, most visitors don't need to rent a motorcycle or find transportation to or from town. Most of the large hotels offer transport, while motorcycle or taxies gather around the hotels or wander in the main road looking for guests. The coconut plantations along the beaches seem not to be popular on Phu Quoc. However, this makes easier for tourism development. Ranging to the South, Duong Dong beach is the location of most of the beachfront hotels, resorts, and bars. Now the far two kilometers of Duong Dong Beach – including all sites covered in this Northern beach, is now full of beach accommodations while the next two kilometers to the South has been increasingly more developed with the arrival of several resorts. If you are looking for the isolated appeal, the peace and tranquillity of the far South zone of Duong Dong may be for you. For those seeking for a genuine escape to chill out, it's easy to find a suitable one here among the wide collection of hotels, from budget one to a high-end or green resort. However, being close to town has its own disadvantage that may not be obvious all the time. While the seawater along Duong Dong Beach looks quite clear, that of the North end has a yellow or brownish color. When you move to the South along the beach, these color disappear and it's becoming clearer. The reason may be that the dirty black water that Duong Dong river pours into the ocean is occasionally washed to the south along the main beach. If you don't like to swim there, it's also a good idea to watch the rustic colorful fishing boats leaving and returning. This is often a popular pastime for visitors. 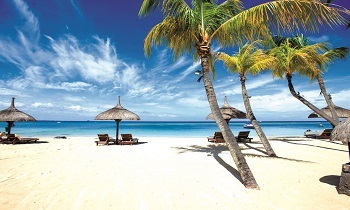 Just sitting on the white smooth sand, hear the ocean breeze murmuring and enjoy the fabulous scene in front of your eyes. Moreover, you can visit a local restaurant, take a seat next to the sea and enjoy a glass of cold beer with some fresh and tasty seafood in this cool and refreshing atmosphere. 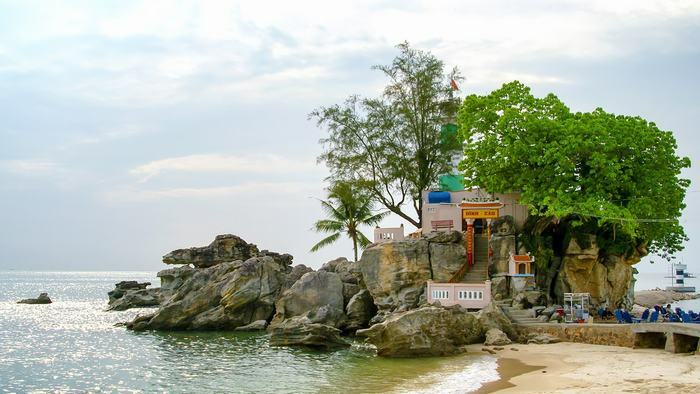 Located right near Duong Dong beach, Dinh Cau Rock, (also called Cau Temple), is an interesting spot that you shouldn't miss once visiting Duong Dong beach. 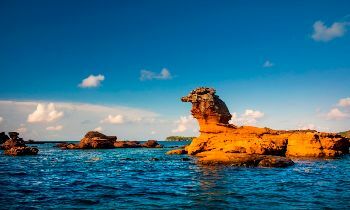 In fact, it is an odd-shaped natural formation where local fishermen frequently come to pray before starting their fishing excursions. Situated next to the Duong Dong Fishing Harbour, Cau temple houses a brightly-colored lighthouse and a Buddhist shrine, making it a famed photography spot among travelers. 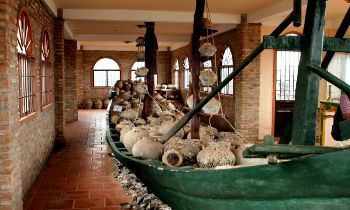 Dinh Cau Rock was established in 1937 to commemorate the goddess of the sea, who is believed to offer the local fisherman protection before heading out to the ocean. After climbing up 29 winding rock steps to reach the rooftop terrace, the visitors will be greeted with the breathtaking sunset views on Dinh Cau Beach with the colorful traditional fishing boats as well as neighboring islets. The temple is fairly quiet during the year, except for the annual festivals including the New Year holiday and Dinh Cau Festival (frequently 15–16 October), when many local people come here to offer prayers as well as burn joss sticks at the main altar. Duong Dong beach and Cau temple are the incredible tourist spot that you shouldn’t miss when coming to Duong Dong town. Each one has its own distinctive attraction that you have to discover by yourself. Do not hesitate to explore Duong Dong beach and Cau temple and have the relaxing moments as much as possible.